Madura Island is part of East Java regency that needs a better access. Madura that consist of four regencies has a lot to offer. It has excellent quality of agriculture outputs and beautiful tourism objects and more. The presence of the bridge had expected to improve smoother flow of people, goods and service from and into this island. Mayor impacts had expected to emerge this facility, be it socially and economically. The Suramadu Bridge that connects Surabaya and Madura Island has expected to complete soon, extending 5.43 km with 28.10 m width. The sea crossing from East Java to the small island of Madura takes just half an hour. Measuring about 160 km in length and about 40 across at its widest point, Madura supports population of close to 3 million inhabitants, whom most are farmers or fisherman. The most famous attraction of this island is the annual bull racing (kerapan sapi), which takes place during the dry season in August – September. These exiting and colourful tournaments consist of a race between two pairs of bulls, each team pulling a rider and sled. Then, the finals are held in Madura’s capital, Pamekasan on October. The interesting part of this attraction is when a rider stands on the ‘Keleles’, yelling and slamming while his hands hold two sticks and slap the bull’s weight and attached to the bulls. 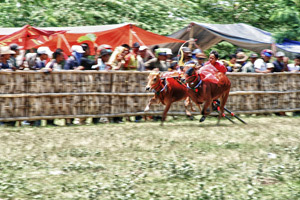 A pair of male cow races each other in 200 m length or known with Kerapan Sapi. Madurese always hold this race yearly from sub district level, district, and finally to get a President Cup. This tradition has done for so long and it is a symbol to thank to God by cow breeders in Madura. Brown cow, a Madurese cow which is always in the race. Tourists are also can notice Sapi Kereman, to enjoy how Madurese takes care of their cows. It is the interesting part, begins with how the Madurese graze the cows, take care of the cow’s health with traditional herbs and train the cow about running. In the middle of Kerapan Sapi, there is an additional attraction “Sapi Sono”. It is a female bull contest. The town of Sumenep of the North Eastern and of the island has some interesting historical, as well as some good nearby. The city’s old palace and museum are worth visiting, as is the large Jami’ Mosque with its green-tiered roof, above the town is the royal mausoleums Asta Tinggi. The two main beaches near Sumenep are Slopeng beach and Lombang beach. The former, which lies on the north coast some 21 km from the town, is a beautiful location with tall palm trees shading the edge of the beach. At Lombang, on Madura’s northeastern point, a long and narrow stretch of white sand is back by dwarf Causarina trees. A narrow road runs the whole along Madura’s attractive north coast, from Slopeng to Bangkalan. There are many small villages and quite beaches on the way, in particular the fishing communities of Pasongsongan and Pasean, where the estuaries have packed with colourful sailing boats. Near to Bangkalan there is Aermata Grave, tomb of Ratu Ibu, which dates back to the mid of 17 century. The tomb set on a hill about 4 km inland the town of Arosbaya. Madura has well known for its Batik Textile production and has its own unique style in the performing art; the island is famous for its Topeng Dalang, a mask dance / theatre, which at one time had only seen within the royal palace. Most popular Batik is at Tanjungbumi, Bangkalan.